A California family has finally had their illegally seized firearms and ammunition returned after over a year in the courts. The collection has an estimated value of over 1 million dollars. It consisted of 541 rifles, pistols, and shotguns, and over 100,000 rounds of ammunition. 10 of the rifles were registered “assault weapons” under California law. One was a bolt action .50 caliber. Albert Sheakalee has had a federal firearms license since the early 1990’s. Sheakalee was mistakenly included on the California Armed & Prohibited Persons System (APPS) because of seeking treatment for high stress during the summer of 2015. He is 60 years old. Sheakalee is a Christian refugee who fled Iran in the 1970’s after the Ayatollah took over the country. He has never had problems with the police and has no criminal record. He prospered in America, earned a degree in accounting, and worked his way up to become budget director of the local hospital’s health care department. However, Coleman said, postal records indicate the letter was not delivered until Nov. 25, 2015, 13 days after Sheakalee was arrested for possessing the weapons. No charges were filed against Sheakalee by the Fresno County District Attorney. On 12 July, 2016, Sheakalee was notified that all charges against him were resolved. No charges were ever actually filed against him. Sheakalee had to go to court to have the million plus dollars worth of firearms and ammunition returned. All of Sheakalee’s firearms were legal. Sheakalee had gone to considerable effort to insure that he met the byzantine requirements of California firearms law. The firearms were locked in safes, in a locked room that had an alarm system. 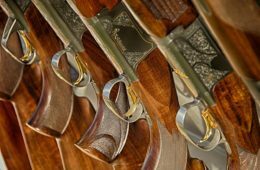 The firearms could have been transferred to another dealer or somewhere else for safekeeping while the legal issues were resolved. So why didn’t the California DOJ call Albert Sheakalee to determine what was going on? Sheakalee was a well respected member of the community who had lived there for many years. He had become prosperous through hard work and frugality. He had a federal firearms license for decades. And it’s because Harris wants to promote her image among anti-gun supporters at Sheakalee’s expense, the lawyer said. “It’s politics. She wants to be senator,” he said. A case of what magnitude? No criminals were involved. A federal firearms dealer had his inventory and collection confiscated because of a mistake in the very database Kamala Harris was touting as a great crime fighting tool. If the case had been investigated and reported on truthfully, it would have been a black eye for Kamala Harris, an embarrassment. Instead, it was touted as a great success and may have contributed to her winning the Senate seat. The Sheakalee family eventually had their property returned, at great expense in time, treasure, and trauma. Kamala Harris is a Senator. Editor’s Note: While I am glad that Mr. Sheakalee’s property was returned, I am outraged that such a miscarriage of justice was allowed to occur in the first place. The fact that an innocent and law abiding man as Mr. Sheakalee had to be subjected, not only to the theft of his property but then to have to spend the time and money in order to fight to get said property back from a corrupt government is outrageous. All to boost a politicians profile. And I do not believe for one second that Mr. Sheakalee recieving that notice 13 days late was an “accident” or an “oversight.” It most likely was a decision made in order so he could not be aware of what was going to happen and pursue the legal means beforehand to ensure that he was safe from this governmental shakedown. I hope that Mr. Sheakalee pursues a civil case against the California Department of Justice, the County of Fresno and Kamala Harris herself for restitution, legal costs as well as punitive damages for all the hassle that he had to suffer. Sure, winning against the DOJ and the County would be coming out of taxpayers pockets, but Kamala Harris would have to pay out of her own pocket especially if it can be proved she attacked Mr. Sheakalee for her own political gain. Two final points. First, this is the kind of police state that Progressives and gun controllers want us to live in. The line must be drawn or this type of California tyranny will spread east. Second, where is the outcry of racial profiling, racism and anti immigration from the Left? I mean, Mr. Sheakalee was a Christian refugee from Iran so why isn’t Kamala Harris being crucified by the left for being intolerant and obviously racist in her witch trial of this innocent man? Healthcare Rights in American, Since When?